Beyond The Wall Tee Review. The Beyond The Wall tee design is for Game of Thrones fans and Incredible Hulk fans. The concept is for the fictional "Night's watch comics" (with an image of Mag Mar Tun Doh Weg the Giant as the Publisher Logo) title Beyond The Wall Approved by Castle Black under oath. Featuring Jon Snow, his sword Longclaw and in it a reflection of a White Walker (instead of Wolverine, his claws and the Hulk). 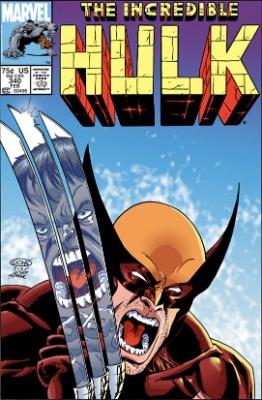 This is a parody of the iconic The Incredible Hulk cover issue #340 (shown below). The Night's King is shown in the lower left hand corner in place of a barcode. As far as the artwork, it is fantastic. Yes, the jaws look a bit weird as they are yelling. But once you get used to the expression you will notice that the coloring and shading is among the best there is. 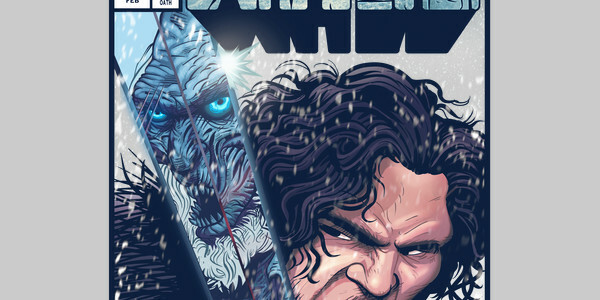 The details from the skin tones, hair, reflection and blade, snow, to the Ice brick "The Wall" lettering take this from a mere "T-shirt design" to an actual work of art. The details are insanely obsessive compulsive. Like a person running around in their underwear during a winter storm with a foil hat on their head and maple syrup smeared on their bare chest while singing Yankee Doodle Dandy level of insanity. There is definitely more work put into this than there was in The Incredible Hulk cover. It is not often that a rectangle design on a tee looks good. So that is an accomplishment in itself. The Beyond The Wall tee is perfect for team Jon Snow and any Game of Thrones fan would like the tee. But only the most devout comic book nerd will get The Incredible Hulk issue references. Beyond The Wall Tee Design by Donovan Alex.